On a scale of 1-10, this DVD is an 11! Whether you’ve done a thousand gigs or you’re just starting out, this will change EVERYTHING! 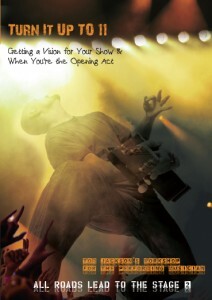 As Tom says, “create moments, don’t just sing songs.” This DVD answers what kind of moments, shows where to put the moments in your set, gives examples of moments Tom has created, and tells how to find those moments in your songs. If you only buy one DVD, this should be the one! You’ll find yourself reviewing it over and over, whenever you change your set list. Find out for yourself why thousands of artists have emailed, phoned, or even stopped Tom in the street to tell him this DVD changed the way they looked at live performance! Don’t Sing Songs, Create Moments! The Question is How Many Songs? Which Song Would Be Best to Introduce Yourself?